An enterprising voluntary outfit in the UK is raising funds to create a library for children in remote villages in earthquake-hit Nepal. On April 25th 2015 a 7.8 magnitude earthquake hit the Rasuwa region of Nepal, claiming over 8,000 lives and causing immense damage in what is still one of the world’s poorest countries. In the Rasuwa district the total population is currently around 57,000, of which more than 17,000 are children aged 5-15. 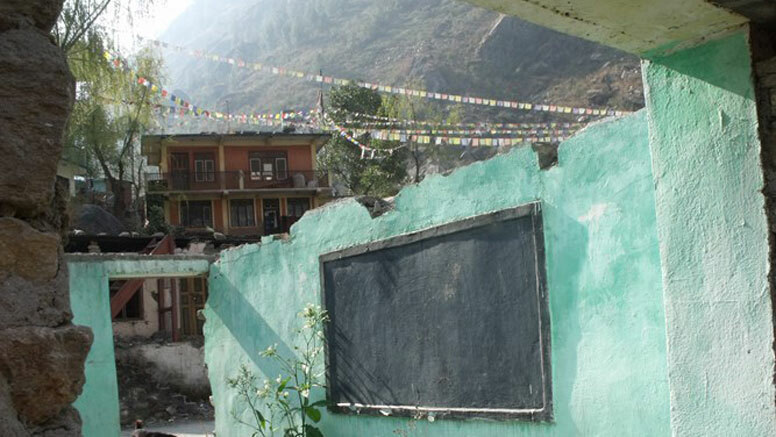 There were 19 secondary schools and 43 primary schools, all of which collapsed or were badly hit by the 2015 earthquake. As of today only 5 have been rebuilt. In 2017, Andrea and Mario Marini spent a period of voluntary work in the school in Jibjibe village (1,610m) in Rasuwa District, 90km north of Kathmandu, collecting and donating books The village was one of many hit by the earthquake and the school currently has 450 students aged 5-15 years from the surrounding villages. Now they want to take the project a big step further and provide a central library for the area for all surrounding schools to use, working with the High Himalayan Community Projects organisation. Before the earthquake HCCP had provided computers, printers, photocopiers and some text books and educational material to a few of the schools in the more remote areas of the Rasuwa district, but all of them were destroyed or badly damaged by the earthquake. This will be the first library and resource centre in the Rasuwa district. You can get involved by following the crowdfunding link on the right of this page. Designing Libraries is helping to sponsor the project. The project background and the fundraising site. Educating rural Himalayan communities to help themselves.